It has been a week since I last posted a review. Sorry about that a lot of things came up and I just could not finish Radiant Shadows by Melissa Marr in time. 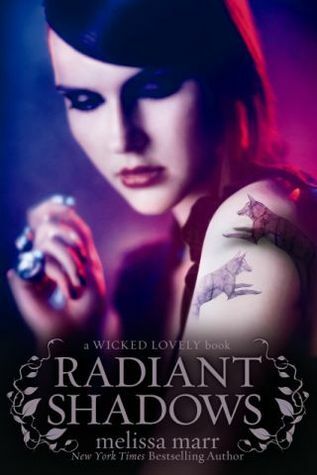 Anyhoo, Radiant Shadows is another filler from the Wicked Lovely series. The novel’s main characters are Devlin, Rae, a dreamwalker and Ani, a halfling and daughter of the Gabriel. I was actually hesitant at first since it’s not actually the continuation of the third book. But truth be told I actually found myself immersed in this book completely. The first few pages were kinda slow for me but as I continued reading I actually found myself breezing through it. I love Devlin and Ani. I don’t know why but I actually found myself feeling giddy in every scene that they were in together. haha. I love these two with their love/ lust. haha. The female protagonist is Ani, she is the daughter of Gabriel of the Hunt and sister to Tish and Rabbit. She’s a half-faerie and half- mortal like her sister and brother but she’s also different in some ways. She was mentioned in the first few books of the series. I honestly didn’t bother getting to know her the first time she was mentioned until I found out that she is actually the main character in the fourth book. I love her character. She’s feisty and honest and she’s not a typical dumb and helpless heroine in most YA novels. I think she’s a good match for Devlin who is a complicated character for me. haha. Then there’s Rae, the dreamwalker. Truth be told, I never really connected that much with this character but I don’t dislike her. I actually pity her for being stuck in Faerie without a physical body. What am I saying? She actually gets to enter Devlin’s body any time she wants too. haha. I honestly liked this book even if it was a little slow in the first few pages. I truly love Ani and Devlin even Iri and Niall were absolutely adorbs. haha. I find the two Dark Kings so cute together. haha. I cried when Bananach did something that she shouldn’t have. Err. I seriously hate Bananach right now. And I loved it when Niall finally showed a part of his “Dark King Persona”. Ugh! I’m in love with Niall again! Overall, I’d give this book a 4/5 star rating. I love the way this was written. The complexity of each character stimulated my brain to actually think. Yes, I’ve been feeling a little dumb lately and I somehow needed a stimulant for my brain and this book did it for me. haha. I just can’t wait to read Darkest Mercy.